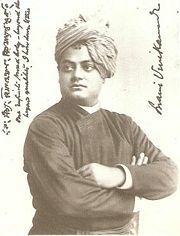 Vivekananda, founder of the Ramakrishna Mission. Chicago, 1893. The Ramakrishna Mission (Bengali: রামকৃষ্ণ মিশন) is an association founded by Sri Ramakrishna's chief disciple and religious leader, Swami Vivekananda on May 1, 1897, who in 1893, when he attended the Parliament of the Worlds Religion at Chicago, was the first Indian guru to visit and to teach in the West. The Mission carries on missionary and philanthropic work through the combined efforts of monastic and householder disciples. The Mission, whose headquarters are near Kolkata, India, is closely affiliated with the Ramakrishna Math (monastery/monastic order). The Ramakrishna Mission emphasizes service to others as karma yoga, a concept found in Hinduism which was a strong motif in Vivekanandra's teaching. It engages in humanitarian activities around the world. Vivekananda saw the same truth underlying all religions and believed strongly in the equality of all. The Mission is dedicated to the service of humanity, regardless of creed, color or nationality. Centers run by the Mission have been prominent in interfaith relations. Philanthropic activities include medical work, education as well as relief and emergency work. Do I wish that the Christian would become Hindu? God forbid. Do I wish that the Hindu or Buddhist would become Christian? God forbid. The Christian is not to become a Hindu or a Buddhist, nor a Hindu or a Buddhist to become a Christian. But each must assimilate the spirit of the others and yet preserve his individuality and grow according to his own law of growth. In many respects, the Ramakrishna Mission resembles the many Christian missionary organizations that were working in India and elsewhere at the time, and arguably it was to some degree consciously modeled on them. However, Christians were often perceived as offering their medical and educational services as a means to convert people, rather than out of unconditional love. Vivekananda regarded karma yoga as an expression of pure, unconditional love, as the Bhagavad Gita says, "Be intent on action, not on the fruit of action." On the other hand, he can be said to have practiced what he preached in that he assimilated from his contact with Christians their concern for social service and, looking deep into his own tradition, found a philosophical basis for humanitarianism according to "his own law of growth." Belur Math, World HQ of the Ramakrishna Mission. The Ramakrishna Mission acquired a legal status when it was registered in 1909 under Act XXI of 1860. Its management is vested in a Governing Body. Though the Mission with its branches is a distinct legal entity it is closely related to the Ramakrishna Math. The Trustees of the Math are simultaneously the members of the Governing Body. The administrative work of the Mission is mostly in the hands of the monks of Math. The Mission has its own separate funds, for which it keeps detailed accounts, audited annually by chartered accountants. The Math and the Mission both have their Headquarters at Belur Math. The Vedanta Society of the City of New York, founded in 1898, is the oldest branch of the Mission in the United States where there are more than a dozen branches altogether. In the developed world, the Mission focuses on education, while in the developing world it engages in both educational and humanitarian activities. The Mission is a registered Society laying emphasis on rendering welfare services undertaken with a spiritual outlook. It's mandate is both to serve humanity and to spread the teachings of Ramakrishna. The service activities are rendered looking upon all as veritable manifestation of the Divine. The Motto of the organization is Atmano Mokshartham Jagad-hitaya Cha. Translated from Sanskrit it means For one's own salvation, and for the good of the world. The following is the traditionally accepted list of Presidents(spiritual heads) of the monastic order. ↑ Vivekananda, "Christ, the Messenger," in Paul J. Griffiths, (ed.) Christianity Through Non-Christian Eyes (Maryknoll, NY: Orbis, 1990, ISBN 0883446626), 204-210. ↑ Vivekanada, Closing Speech, September 27, 1989, Concluding Address, The World's Parliament of Religions Retrieved February 8, 2008. ↑ Gita, : 47, in B.S. Miller, The Bhagavad-Gita (NY: Bantam, 1986, ISBN 9780231064682), 36. ↑ Koenraad Elst, “Who is a Hindu?” (New Delhi, Voice of India, 2001, ISBN 8188388254). Who is a Hindu? Retrieved February 8, 2008. ↑ ”Monks with a Mission,” Hinduism Today, August 1999, Monks with a Mission Retrieved February 8, 2008. ↑ See Koenraad Elst, “BJP Retreat from Ayodhia,” The Weekend Observer, New Delhi, Saturday, December 7, 1996. “BJP Retreat from Ayodhia” Retrieved February 8, 2008. National Seminar on "Philosophy and Science of Value Education in Today's Context." Philosophy and Science of Value Education in the Context of Modern India. Kolkata: Ramakrishna Mission Institute of Culture, 2006. Sen, Amiya P. Swami Vivekananda. New Delhi: Oxford University Press, 2000. This page was last modified on 24 June 2015, at 22:32.